With the Canadian border behind me, I researched some of the trail I previously had to miss. 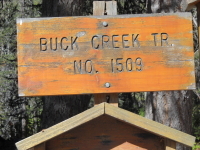 The closet trail head was a full day drive to <?xml:namespace prefix = st1 ns = "urn:schemas-microsoft-com:office:smarttags" />Buck Creek at Trinity in Glacier Peak Wilderness. Trinity was the old mining town of the 1920’s built by a New York investment company who went bankrupt leaving the town miners with no provisions or money for the winter. The town is now privately owned but the buildings are still visible from the forest area. 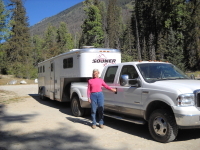 We arrived at Chiwawa Horse Camp by 3 and decided to camp there and get to Trinity in the morning. Up and heading towards Trinity and Phelps Campground by 8 am gave me enough time to ride so I was quickly tacked up Issy and explored the area. There was no drinking water but we were close to the Chiwawa River and there was a stock tank at Buck Creek Trailhead a short distance away. I was really looking forward to riding to the PCT on Buck’s Creek Trail as I had ridden a few miles out and it was a glorious horse trail. We were on the trail by 7am and Issy was full of himself since we only had ridden 10 miles yesterday. We started right out with incredible mountain views of Glacier Peak and Plummer Mountain. The photos didn’t do justice but I snapped the shutter hundreds of times hoping to be able to at least get a fraction of a feel for it later. The trail was a steady climb but always wide and with lots of creeklets for water. There were several camping spots with sparse graze and we crossed the paths of many hikers but no other stock. We climbed from 4,600’ to 6,200’ with Issy strong and pulling. We traveled through boulders and forest with the temperature holding around 40 degrees. We passed though several avalanche chutes and came to an area where a swath of trees were bent and broken from the tremendous force of an avalanche. We took switchbacks and a rock outcropping and got to Buck Creek Pass before noon covering over 9 miles in no time. Issy seemed to have no interest in resting so I just pushed on towards the PCT hoping to get there and back before dark. Buck Creek Trail turned rocky and difficult but Issy showed no signs of fatigue. He placed each foot as if he calculated the exact spot for each and still barely slowed his pace. What a perfect horse for the rigors of this trail. There were a few downed trees but nothing to even cause Issy to look twice. Red-hued Plummer Mountain was striking as was all the snow covered glaciers on Glacier Peak and we soon were close to the PCT but had to turn around and head back to camp. Now nothing was of any consequence for Issy as he motored down, up and along the hillsides to camp and I was feeling like I should have brought my camping gear since we covered the 31 miles in a very short time. When we arrived back at camp Burton told me about a snow storm which had the potential to close some of the higher elevations and felt we should try to head south and not get caught in it. We still had a few hours of daylight and I pulled out my trail maps to see if we could hit the PCT from Stevens Pass area but as we pulled out of the wilderness I had internet service and one of my emails was a warning from a concerned horseman (Ed) who saw the storm and knew it was going to be bad. Burton and I both had no desire to be at these high elevations in a snow storm and we decided it was time to just head home and leave the rest of the unfinished trail miles for next year. Being chased off the trail by snow was perfectly acceptable to me since I had gotten to Canada and no longer felt like I had failed at that goal. Yes, we were both ready this time so with Issy already loaded we started the long journey to Mena, Arkansas.